Here at Trust Auto, we believe that having an emergency kit in your car at all times is very helpful. You never know what can happen and when so rather be safe than sorry, right? Below is a step by step guide to building an emergency kit for your car, winter edition. Grab a bucket or duffle bag to place all of your items in. You don’t want something huge… maybe a medium size. You can go to your local grocery store to purchase an already built emergency kit that has bandages, medicine, and other small items for medical issues. This small medical kit can go in your big, overall car kit. Place a blanket or two inside. Add water bottles and perishable snacks. Put flashlights and batteries inside. Having a neon windbreaker is nice incase your car breaks down at night, your body is visible to those driving on the road. Get some jumper cables to have in the kit too. After adding all necessary items, zip up your bag or close up your bucket and place it in the trunk of your car. Now your off to being prepared at all times. Safe driving! Winter time can be scary when it comes to driving, depending on where you live. Some areas experience more snow than others. Our focus is to make sure everyone is driving on the roads as safely as possible. Of course we recommend keeping an ice scraper in your car at all times, but if you happen to forget it… no worries! You can always use a credit card! Just like we think it’s best to keep an ice scraper on deck, we believe having an emergency kit on hand at all times is of importance too. Need help putting one together? Check out our blog post here on creating an emergency kit for you car. If you know it’s going to be snowing, raise your windshield wipers the night before to make your life a whole lot easier for the next day. You can put tube socks over the wiper blades as well to keep them from freezing. Last, but not least placing Ziploc bags over the side mirrors can be very helpful in helping keep snow off your actual windows so when you go to scrape the snow off you can simply just remove the bag. What did we miss? Comment below any other tips or tricks you have! For more blog post on driving during Winter time, keep reading. Local to Syskeville, Maryland or live in a surrounding area? Come check us out! We offer financing and to help you come ready to go, click here, to pre-apply. To view our inventory ahead of time, click here. Before the cold weather really hits, it is best to prepare your car as best as possible to ensure that it’s running well and safely. While vehicles are made to handle inclement weather and cold temperatures, there are a few steps you can take to ensure your car is in the best possible condition. Whether your car has front-wheel drive, all-wheel drive, or even four-wheel drive, inspect yours tires to make sure the tread is deep enough and the tire pressure is accurate. Worn down tires can be hazardous on slick winter roads. Tire Pressure – If you’ve never checked your tire’s pressure before, refer to your owner’s manual for the proper PSI. Most gas stations have air stations for your tires. Tread Check – The easiest way to ensure your tire tread is safe is with the penny test: hold a penny between your forefinger and thumb so you can see Lincoln’s head. Place the penny (upside down) in the tire tread and if you can see Lincoln’s whole head, your tires need to be replaced. Make sure your car’s fluids are all topped off to start the cold season. You can check at home or take it to your local mechanic. Oil – Mechanics sometimes recommend using thinner oil in the winter months because the cold weather can make it thicker and harder on your engine, but check your owner’s manual just in case. Coolant – If you live where temperatures get below freezing, it is important to have the proper water/antifreeze mixture to prevent your radiator from freezing. You can pick up a tester at any auto parts store to make sure the fluid is filled up to maximum capacity. Windshield Washer Fluid – This may get overlooked, but make sure your washer fluid contains antifreeze so you can see clearly all winter long. It’s not only your engine that dislikes cold weather – your battery gets cold too! In fact, colder temperatures can wreak havoc on your battery capacity. Check your battery for any cracks, make sure the cable connections are snug, and check the charge level. You can do this by turning off your engine and looking at your battery’s built-in hydrometer to check the voltage levels. If your car doesn’t have a hydrometer built-in, you can pick one up at an auto parts store. 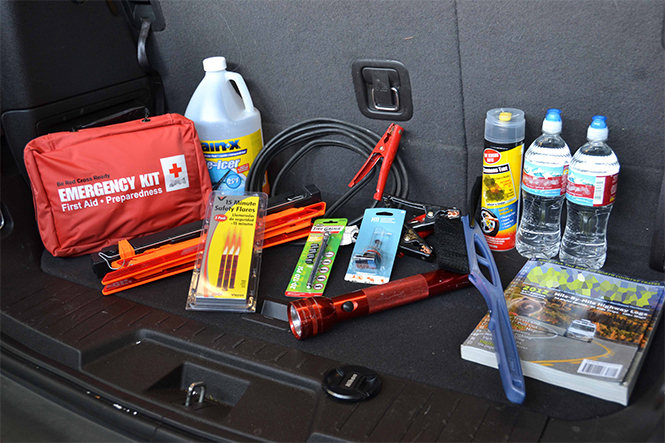 In case of an emergency, you’ll want to be prepared with all the essentials for both you and your vehicle. Use this checklist to make sure you have everything you need in case you get stranded this winter. The best way to ensure your car is running smoothly this winter is to stay on top of routine maintenance – this means getting your oil changed regularly, have your belts and hoses checked by a mechanic, and get your engine tuned up as recommended. Every vehicle is different, so reading over your owner’s manual before the cold weather strikes can be incredibly helpful so you know what to expect. With the winter months quickly approaching, driving becomes more hazardous and risky as the roads are slick. These tips will keep you (and others!) safe on the roads, no matter what Mother Nature has in store for you. As the temperature drops, so does the pressure in your tires. Less tire pressure can result in poor road safety and can wreak havoc on your breaking abilities. It is recommended to check your tire pressure at least once a month, and you may even decide to switch to winter tires. Regardless of whether or not you change your tires to winter or all-weather tires, check the tread on your tires. This can be easily done by doing the “penny test.” Hold a penny between your thumb and finger so that Lincoln’s head is showing. Place the top of Lincoln’s head pointing down into one of the grooves of the tire’s tread. If any part of Lincoln’s head is obscured by the tread, you have a safe amount of tread, however, if you can see Lincoln’s whole head, it’s time to replace your tires. Giving yourself plenty of space between the car in front of you will allow you ample breaking time, which can help avoid spinning on slick roads. When accelerating, practice going slowly and working up to a safe cruising speed. If you try to break or accelerate too quickly, your tires will spin because it won’t have enough traction on the slick roads. If you find your tires spinning, release the accelerator until you regain traction. It does help to remove your foot from the brake and accelerator and to steer in the direction you want to go. Do not slam on the break or accelerator until you have regained control of the vehicle. Remaining calm in a situation like this can help prevent accidents. As temperatures drop, your vehicle’s oil gets thicker, which puts strain on your car’s battery (it requires more power). This can be particularly strenuous on batteries that are 3+ years old. 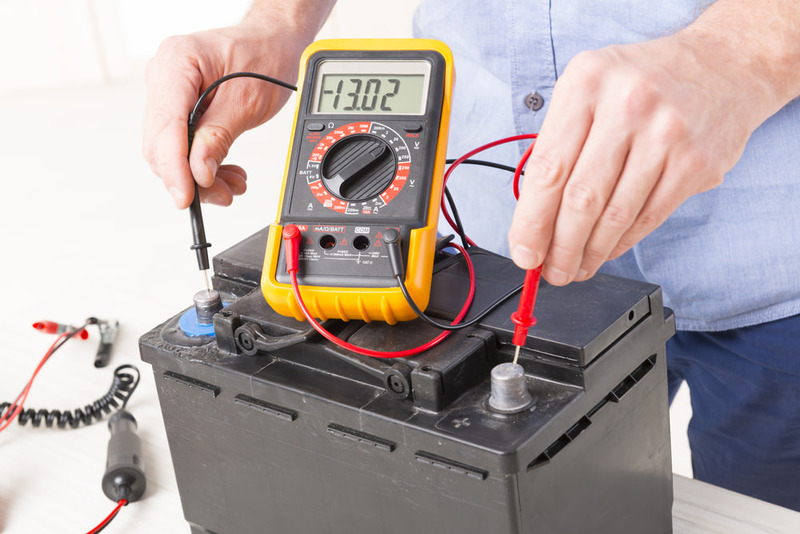 If you don’t know when your battery was last replaced, pop your hood and look at the battery – there will be a date on the casing. Colder weather causes oil breakdown faster than your area’s “normal” temperature range, so you should get your oil changed more frequently in the colder months. Before the first frost, schedule an oil change to start the season with fresh oil. Keep an eye on it if you have an especially harsh winter. First-Aid Kit – bandaids, antiseptic ointment, Ace bandage, etc. Mother Nature has a way of unexpectedly throwing bad weather our way, so always be prepared for snow, ice, sleet, and any emergency situation on winter roads. Death doesn’t take a day off. Dangers are mostly due to the increased amount of traffic on the roadways – an estimated 37.5 million people are projected to hit the road and jam the highways during this holiday weekend, according to the American Automobile Association (AAA). This increased risk is partially due to the fact that the 4th of July is often a “4-day weekend” with frequent travels to the beach and warm getaways. While driving under the influence is often the biggest culprit when it comes to auto accidents, experts say that there are other hazards associated with holidays that are equally as dangerous. It’s no secret that there are an abundance of Firework displays on the 4th of July. After listening to the roar of fireworks, your ears may still be ringing when you get in the car and could potentially drown out the noise of sirens, horns, or other roadway sounds. Fireworks can also cause visual distortions for a short period, so it’s recommended that if possible, you wait 20-30 minutes after the fireworks show to get in your car and drive. Many travelers drive through the night to get to their destination, so it’s common for drivers to get weary while driving. It’s also common for people to stay up late packing or getting up early to hit the road, which can impact the proper amount of sleep a driver gets the night before. Not getting a full recommended 7 hours of sleep the night before nearly doubles your chances of getting in an accident. If you are travelling a long distance, stop every 200-300 miles at a rest stop to get out and stretch or even take a cat-nap to refuel before continuing your journey. Police reports that nearly 100,000 crashes per year are the results of driver fatigue. Even if you think you are being safe driving “hands free,” an AAA survey shows that sending text message using voice commands can be just as distracting as regular texting. Getting distracted with visuals on your dashboard or console also prove to be highly distracting, and can take driver’s attention away for up to 27 seconds. Even driving at 25 mph (about ⅓ the speed of most highway limits), that’s long enough to travel up to the length of 3 football fields and plenty far enough to put you and other cars around you in danger. Using cruise control may not be the best idea either if you are travelling long distances because it can cause you to lose focus on the road and your surroundings. Spending time out in the sun, playing outdoor summer games of flag football or volleyball, and even having a beer or two at a BBQ can cause you be dehydrated in the summer heat. July tends to be one of the hottest months of year and it’s often difficult to tell when your body is dehydrated until it’s too late. Dehydration can mimic the effects of alcohol – its can slow down your reaction time and increase fatigue. Believe it or not, driving alone can decrease your road performance. Your passenger is likely to help you stay focused by texting for you or taking phone calls instead of the driver. Women are generally better at this, says Chris Hayes of Travelers Insurance, because women will speak up when they are driving in the car with a distracted driver. Having another person in the car also means you can share the driving responsibilities, so there’s less of a chance of driving while tired or distracted. So if you are traveling on or around the 4th of July, be sure to get a good night’s rest the night before, and stay hydrated and alert during your travels. Even you are being safe, being aware of your surroundings is still incredibly important – other drivers may be driving while intoxicated or distracted. Memorial Day Weekend marks the [un]official start of summer and that means trips to the beach, day trips, and lots of heavy traffic on the roads. The holiday weekend runs from Friday May 25 at 6pm to 11:59pm on Monday May 28th. Drivers are in a hurry to get where they’re going, frustrated sitting in traffic, and when drivers are aggravated, they’re 20% more likely to get in an accident. In general, summer is the most deadly driving season – more deaths occur during the three summertime holidays – Memorial Day, 4th of July, and Labor Day – than the rest of the year’s holidays. According to the National Safety Council, each summer holiday typically claims over 110 lives each day, the highest average per-day fatality rates. Research shows that red-light violations are 27% higher on Memorial Day Weekend than compared to the average holiday weekend with over 2.3 million drivers in 18-states running red lights on the holiday weekend last year. That averages 1.2 red-light violations each second of the weekend. The increase of distracted driving certainly plays into this – just one glance at your phone can result in running a red light, crossing into another lane, or worse – hitting an innocent bystander. If we pay attention, slow down and be courteous, we can increase our changes of making it to picnics, beaches, and barbeques rather than emergency rooms,” says Deborah A.P. Hersman, the President and CEO of the National Safety Council. If you are sitting in stop-and-go traffic for a long time, it can be easy to get distracted and start fidgeting with the radio, playing on your phone, or even just getting carried away with your passengers. It’s very important that you stay fully alert and pay attention at all times so you see merging cars, pedestrians, or emergency vehicles that are navigating their way through traffic. Don’t allow distractions to be the cause of reckless driving while you are on the way to your destination. It’s better to arrive at your destination safely, rather than on time. There will inevitably be more traffic on the holiday weekend, so plan accordingly – leave earlier than planned, take an alternative route, and know it will take longer to get to your destination than on any other weekend. Don’t rush traffic lights or speed to make it there on time, drive safely and cautiously to prevent accidents due to being in a hurry. If you are traveling a far distance for the holiday weekend, plan breaks every few hours to get out and stretch. Stretching your legs and giving your brain a break will allow you to stay more alert when you are back on the road. If you stop to get food, park further away so you have to walk a little more. Plan your travel around the times when risk is lower on the roads. Friday afternoon poses the greatest risk since people are getting off work and are ready to enjoy their long weekend. During these times, there is a higher risk for accidents since people will likely be hungry (which can contribute to stress levels). Be sure your visor doesn’t block the roadway and you stay alert and focused. It’s always sad to hear about accidents that could have been prevented. We wish everyone a safe and accident free Memorial Day Weekend! May is Motorcycle Safety Awareness Month, and as the temperatures get warmer and we draw closer to summer, more and more motorcycles will be out on the roads. As car and truck drivers begin to share the road with their 2-wheeled friends, there are some things they need to know in order to keep everyone safe. Because of the narrow profile of a motorcycle, motorcycles can be easily hidden in blind spots or objects along the road at intersections like hedge rows, bridges, and fences. Take an extra moment to look for motorcycles. Again, due to the smaller size of motorcycles, they may seem further away than they really are. Take time to double check before changing lanes or turning at an intersections. Motorcyclists often change their position in a lame to account for road bumps, potholes, or debris. By no means does this mean they are making room to share a lane with a vehicle or allowing a car to go around. Turn signals on motorcycles are not self-cancelling like in cars or trucks, so their drivers (especially beginners) may forget to turn them off after changing lanes. Be aware of what a motorcycle is doing on the road. Due to their small size, motorcycles can maneuver traffic a lot easier than 4-wheeled vehicles. However, they can’t always dodge out of the way, so give motorcyclists more space in to avoid an accident. Just because motorcycles can maneuver traffic with greater ease doesn’t mean theycan stop on a dime – especially if road conditions aren’t ideal. If the roads are bumpy, uneven, or slick, motorcycles will have a harder time slowing down. Allow more distance between yourself and a motorcycle to account for perhaps a longer stopping period. Motorcyclists often slow down by rolling back on the throttle or by downshifting, so you may not see brake lights. Again, another reason to leave more distance between you and them. Over half of the fatal motorcycle accidents involve another vehicle. This is because of all the things mentioned above (lower visibility, longer stopping distances, etc.) but also partially due to the fact that there are simply more cars and trucks on the road than motorcycles. Keeping everyone safe this motorcycle season is important, which is why these tips can help save lives. By being aware of your surroundings and watching for others, we can work to avoid the reckless accidents between 4-wheeled cars and trucks and motorcycles.